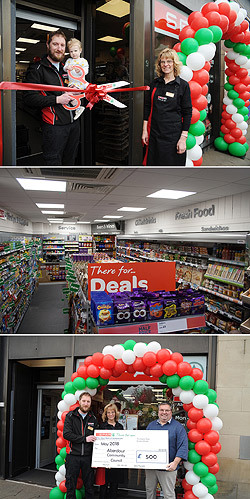 SPAR Aberdour officially opened its doors on Friday 4th May with a red ribbon cutting by the store owner Daryl Philp. To celebrate their launch, the store handed out SPAR brand goody bags to the first 100 customers through the door! There was also a selection of SPAR branded products for customers to sample in store. Customers could enter prize draw competitions with lots of fantastic prizes up for grabs. In addition to this, customers were treated to some great, promotional prices on a variety of different products. Aberdour Community Council was presented with a generous £500 donation from the owner. Daryl Philp said: “We would like to thank the people of Aberdour for joining us on our opening day and making us feel welcome in the village. We have really enjoyed getting to know the local residents and look forward to building a long lasting relationship with the community”. The store has a free to use ATM, fantastic fresh and chilled range including local suppliers and bean to cup coffee.